Night after night the pauper Eizik of Cracow dreams of a treasure waiting for him underneath a bridge in far-away Prague. So begins the famous Hasidic tale attributed to Reb Simcha Bunim of Pshiskhe and retold by Elie Wiesel in his book “Souls on Fire.” When Eizik finally decides to make the long trek to Prague, he is taunted at the entrance of the city by the captain of the guards who mocks him for believing in silly dreams. Of course, Eizik returns to Cracow and finds the treasure beneath his own stove, buried there all along. The story’s message, that there is no need to search for truth and meaning in far off, distant places, that, to paraphrase Dorothy at the end of “The Wizard of Oz,” if you’re looking for your heart’s desire you never have to seek any further than your own back yard, is one that resonated deeply with the Hasidim of Pshiskhe. I recently had the privilege of discussing the world of Hasidism in general, and particularly the school of Pshiskhe, with Prof. Wiesel when I presented him with a tallit tied with strings of authentic biblical blue tekhelet. The secret of that blue color, lost to the world for more than 1,300 years and only recently rediscovered, is a topic that I have been researching for more than 20 years. 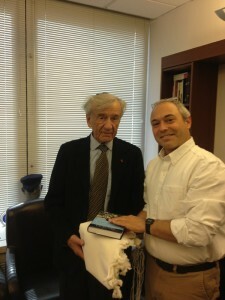 My wife and I wrote a book on the subject, “The Rarest Blue,” which I also presented to Prof. Wiesel. One of the great masters to emerge from the Pshiskhe line was Gershon Henokh Leiner, the Rebbe of Radzyn, who devoted his life to the rediscovery of the lost tekhelet. Gershon Henokh’s grandfather, Mordechai Yosef of Ishbitz, famously broke away from his Rebbe, Menachem Mendel of Kotzk, perhaps precipitating the Kotzker Rebbe’s breakdown and 20-year seclusion. These personalities and their stories are fascinating; Professor Wiesel wrote about them, and in one chapter of our book we briefly traced the history of Radzyn over the five generations from Mordechai Yosef through the last of the descendants, Reb Shloimele, who was murdered by the Nazis. Those of the Pshiskhe School were revolutionaries, challenging the regnant Hasidic belief that only the great and holy Rebbe could bring salvation. They maintained that while a Rebbe can offer important guidance and direction, true spiritual growth does not come from anywhere else but only from deep down inside yourself, from “your own back yard.” This was a biting critique of the establishment, of the founders of the great dynasties of Hasidic culture. The notion that truth, significance, purpose and redemption were to be found and achieved only by profound heart searching was the hallmark ideology of Pshiskhe. But each of the Rebbes of that school of thought took this core principle to radically divergent places. Menachem Mendel of Kotzk believed in rigorously disciplined introspection; he was a purist, scathing, harsh, cynical and relentless in his demand for self-analysis and absolute rejection of affectation and posturing. When the Hasidim in Kotzk prayed, they did not move. Any external sign of piety was deemed pretentious, the slightest outwardly directed gesture, deplorable. All efforts toward spirituality were directed inwards. The story is told of the great student of Kotzk, the Hidushei HaRim, who after one prayer session — though someone observing from the side would not even have noticed that he was praying — was bathed in sweat and had actually cracked two of his teeth. The Rebbes of Ishbitz/Radzyn — Mordechai Yosef, the Bais Yaakov, Reb Tzadok HaCohen of Lublin, Gershon Henokh — cast the ideas of Pshiskhe in a different light. The notion that redemption is to be found only within was seen not as constricting but as liberating, invigorating, a testament to the greatness and importance of each individual. Every person is unique, with his own talents and experiences, and each has a specific part to play, large or small, in God’s great plan. At every turn of events, at every crossroad, man is offered a singular opportunity to follow his path towards his destiny. In order to fulfill that destiny, he must look deep inside to understand his true self, to try to discover his role in the world, and to focus all of his actions on that mission. Prof. Wiesel looked at me, then at the prayer shawl, and then back at me with penetrating eyes: “And so, Reb Baruch, is this your mission?” I hesitated, never having actually framed such thoughts along those lines. In that brief, time-contracted moment, I reviewed my life, my accomplishments, my aspirations, my priorities. “Yes,” I replied, surprising myself somewhat, “I believe that it is.” Prof. Wiesel smiled gently and returned his gaze downwards, contemplating the sky blue of the tekhelet strings wrapped around his fingers. In the book that I presented to him, I inscribed the famous passage from the Shema prayer referring to the thread of tekhelet, “And you shall see it, and remember all of God’s commandments, and you shall do them.” To see — to bear witness; to remember — to never allow anyone to forget; to act — to work tirelessly in the service of mankind. It struck me as I stood there that perhaps this was Elie Wiesel’s mission.